When cleaning after microbial growth, it can be a tedious day. We want to make sure the walls, ceilings, floors, and content are not in any danger for additional mold growth. When the humidity level in the air is higher than normal, it can create the perfect conditions for microbial growth. 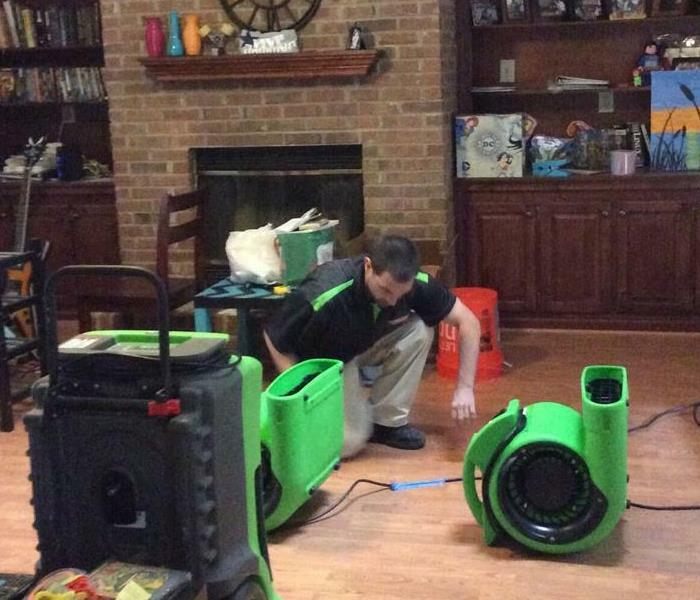 We love our SERVPRO equipment that helps lower the humidity level in a home! 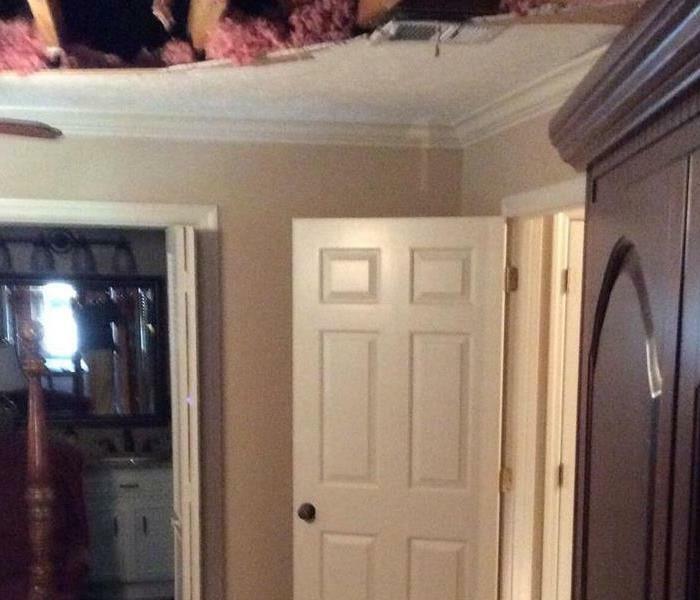 This home was open to disaster when a massive storm created a significant roof damage. Naturally, water seeped into the home which caused ceiling damage. In turn the flooring was wet, but we were able to remove the water. This commercial property had a common water problem- standing water on their roof which caused a leak. 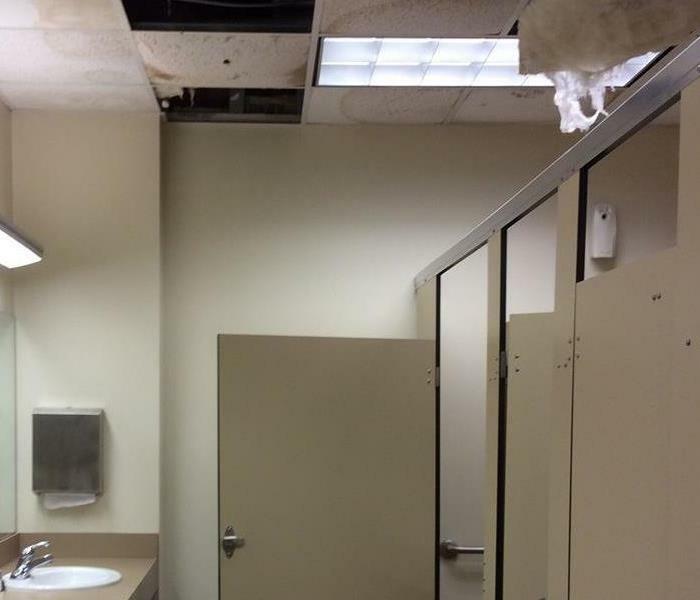 The leak began to saturate the ceiling in the restroom. SERVPRO of Houston County removed the damaged area. 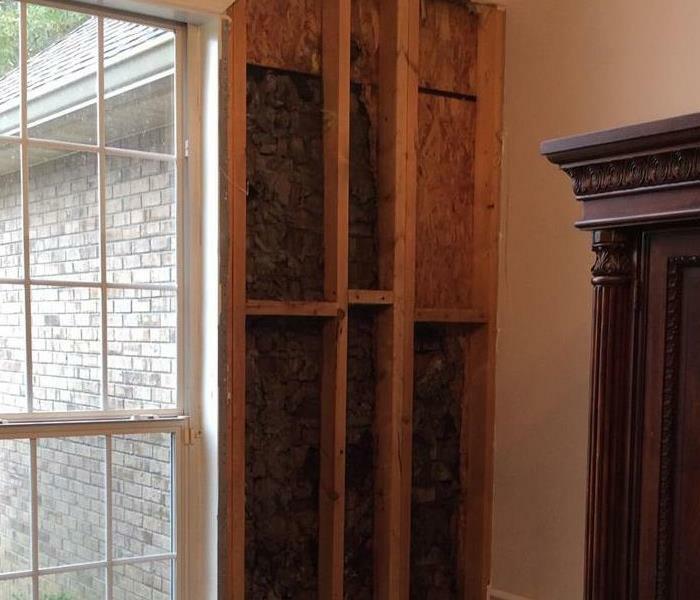 Storms bring a lot of disaster to the homes in its path. This home had severe roof damage which caused the ceiling to collapse. We came in to remove the ceiling debris. 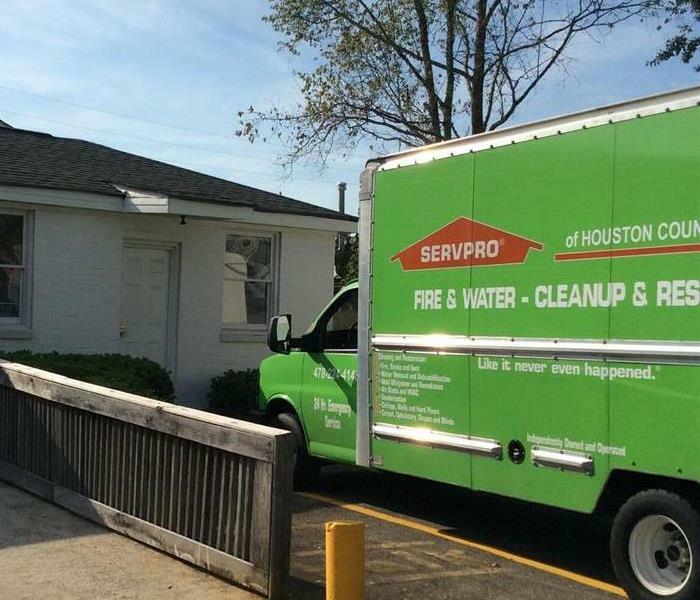 SERVPRO of Houston County responded to a small water leak in this commercial property. 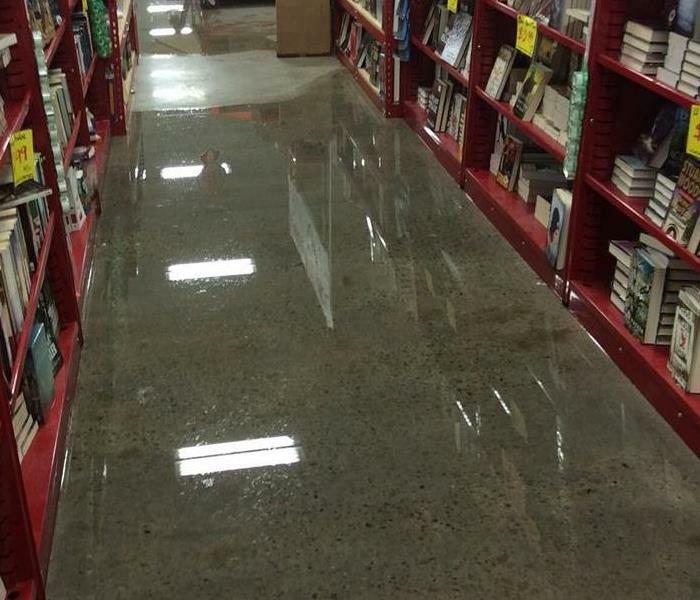 We were able to remove the access water and clean the flooring to make it look "like it never happened." This hallway bathroom had a leaking pipe. The small leak turned into a full floor removal due to the amount of water that had been leaking. 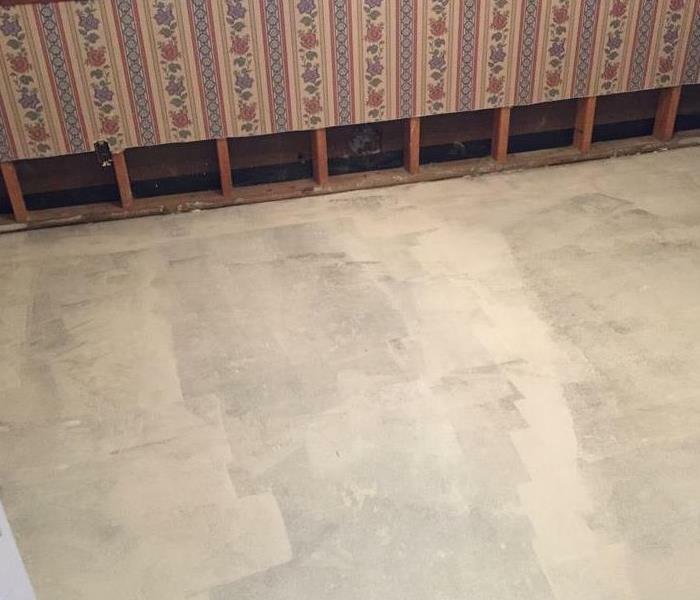 SERVPRO of Houston County removed the flooring to dry the area underneath. When it comes to cleaning debris after a job, our technicians know the best possible way to do that cleaning. Here you can see our technician cleaning after a fire job. This fire did an extensive amount of damage in the kitchen. Here you can see the refrigerator that was damaged. The freezer is almost completely gone. Needless to say, this item was beyond repairable, even for SERVPRO. Our vehicles assist us in so many ways! 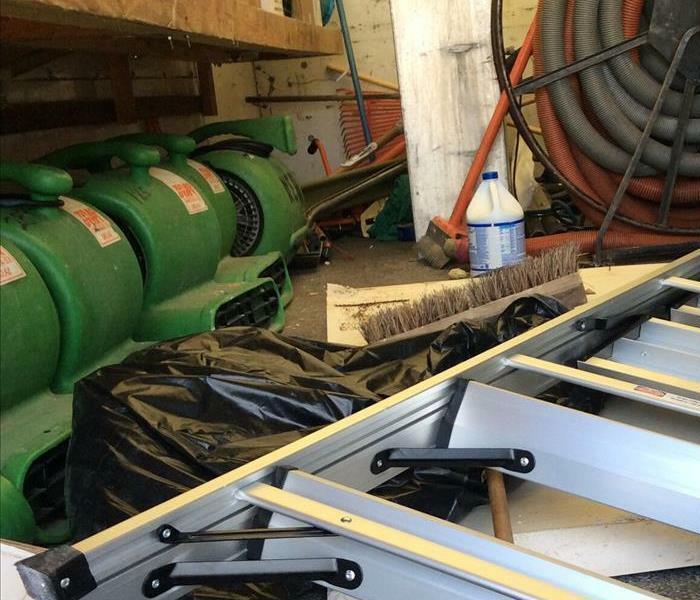 We are able to keep a significant amount of equipment stocked so we are always ready for any job that comes our way. Because of a recent storm, we were called to a massive water leak. We removed the chairs to clean them outside while other technicians were inside cleaning the floors. 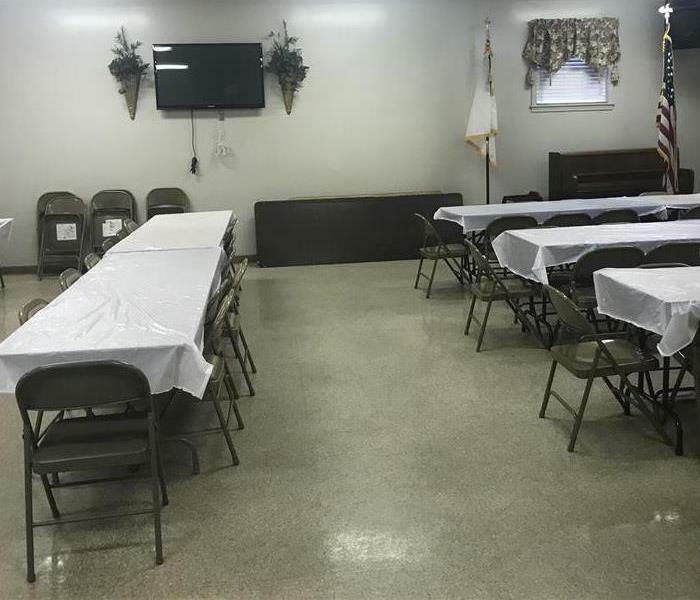 Once the flooring was cleaned, we took the chairs back inside for an additional cleaning. 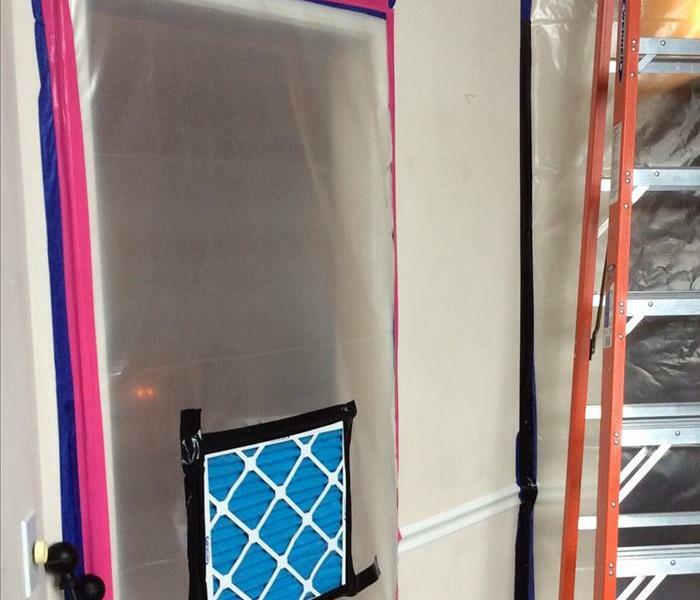 We placed dehumidifiers to reduce the possibility of microbial growth to occur. When a recent thunderstorm brought lightening, there was a small barn that was struck by lightening. Fire sparked and burned down the whole structure before a firetruck could extinguish the fire. 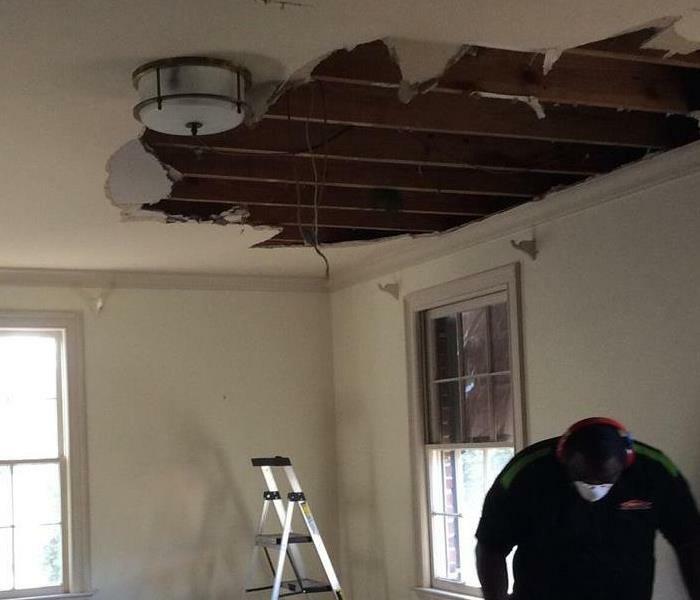 SERVPRO of Houston County had to remove drywall and insulation in this breakfast nook due to damage left by a storm. We were able to remove the damage areas and dry the remaining materials. Roof damage is very common during a storm. 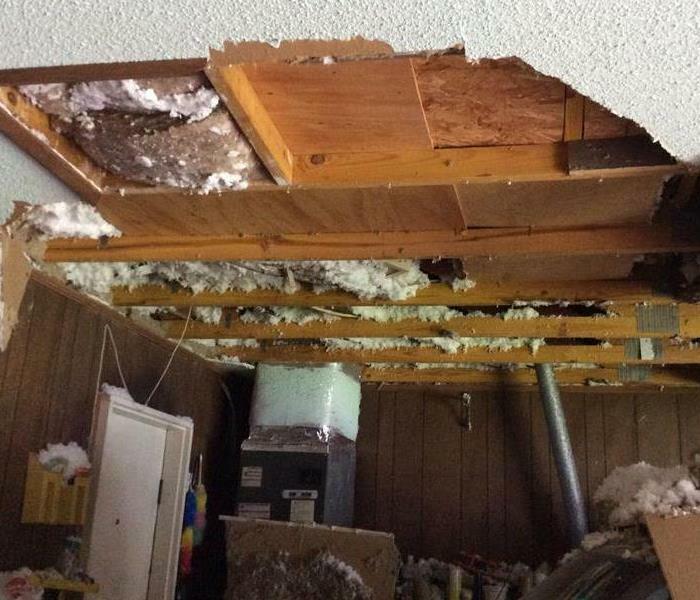 When this garage was damaged, it created pressure on the ceiling. It resulted in a collapsing ceiling. We came to repair the damage. A storm created the perfect conditions for microbial growth. 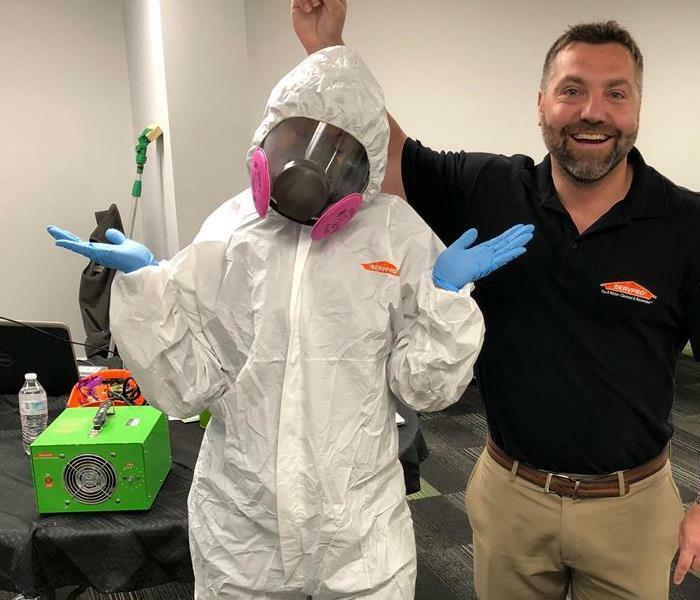 SERVPRO of Houston County placed a containment barrier to protect the remainder of the house that had not been affected by the mold. Microbial growth was occurring under the carpet and carpet padding. 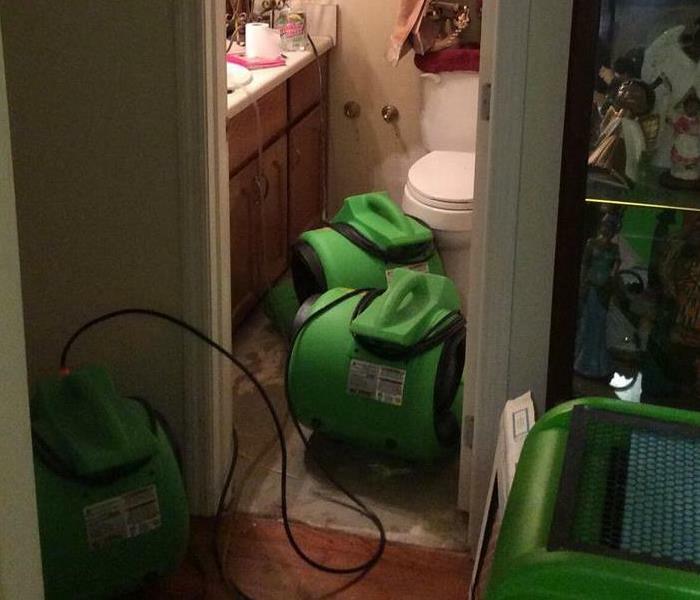 A water loss had gotten the carpet wet, but the homeowner believed it had dried properly. 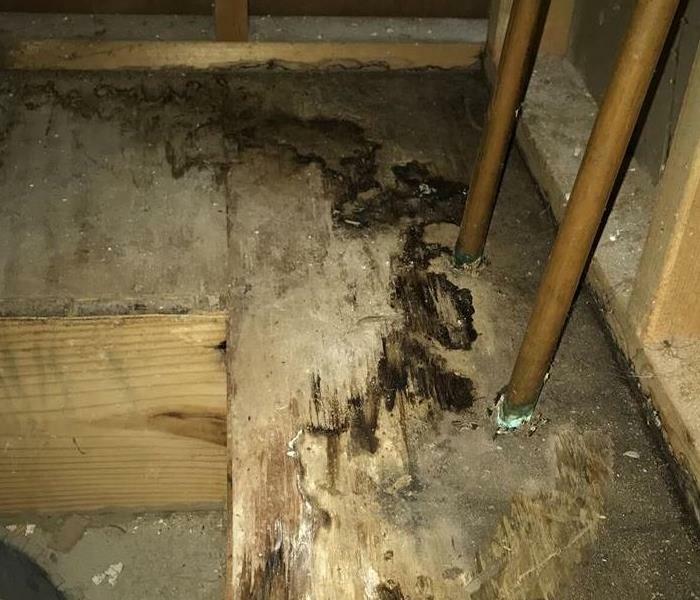 It was not until the homeowner begin to smell something that there was a further inspection that there was a realization of the mold growth. Microbial growth can happen anywhere in the home when the conditions are right. 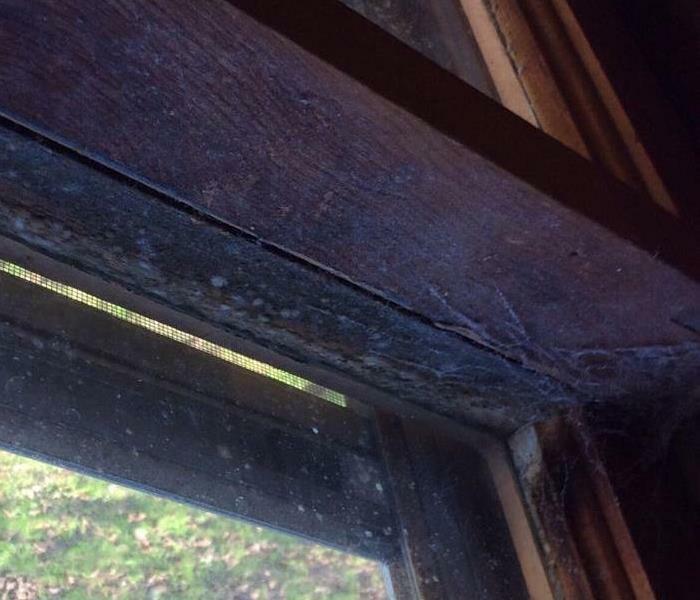 This picture shows mold growing on the wood in a window. We came in and removed the damaged area. 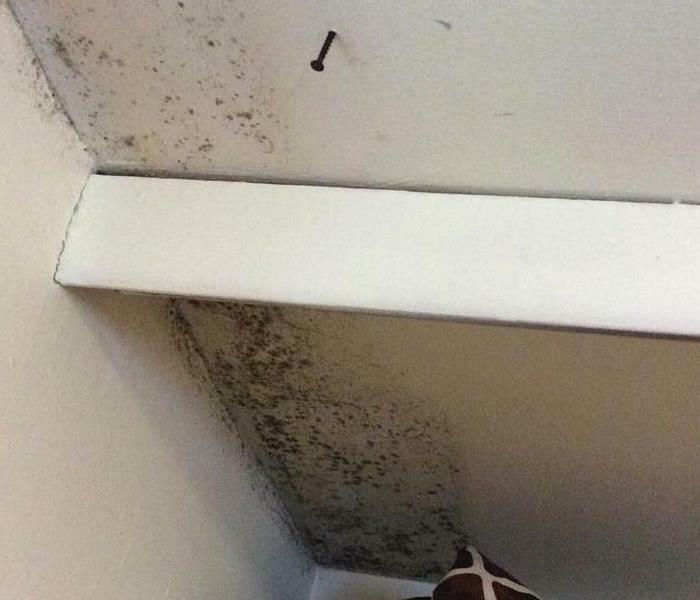 Here you can see a slight microbial growth that is occurring in the closet in a home. SERVPRO of Houston County came to clean the area and remove any damage. When a water loss occurs in a home, it is very likely the homeowners will lose some contents. When the homeowner decides it is damaged out, they usually leave the discarding of the items to us. 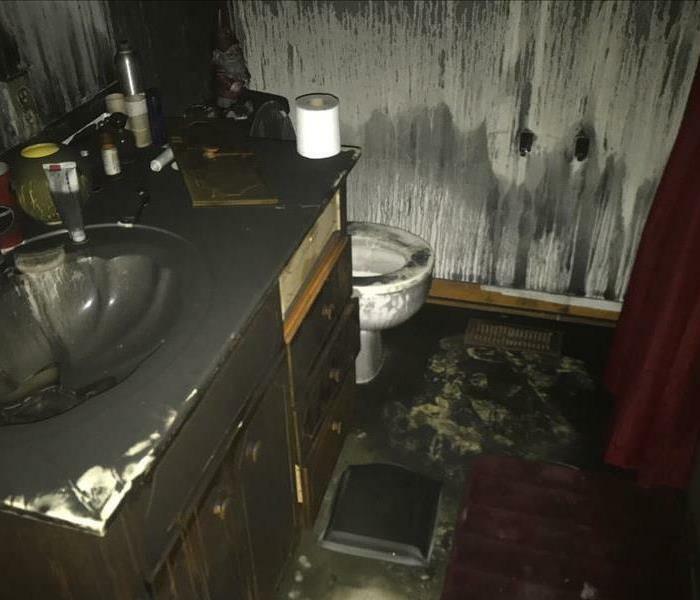 A water loss occurred in this home when the family was on vacation. 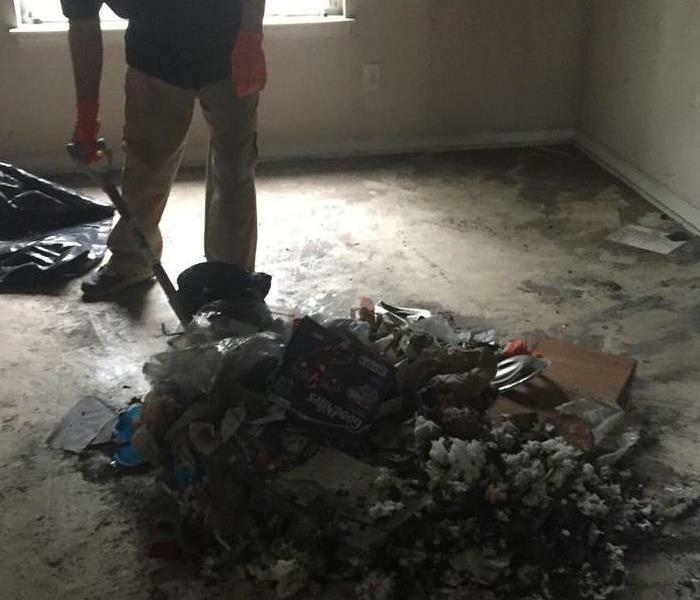 When the family returned home, they noticed the damage and immediately called SERVPRO of Houston County to do the repairs. When we are on a water job, we always use our SERVPRO approved drying equipment. 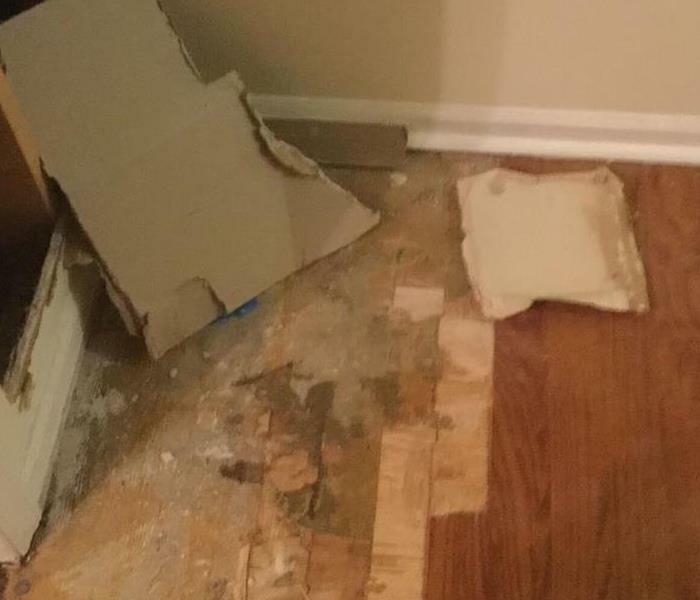 The equipment dries the customers flooring, walls, ceilings, and more in order to repair the home to make it look "Like it never even happened." 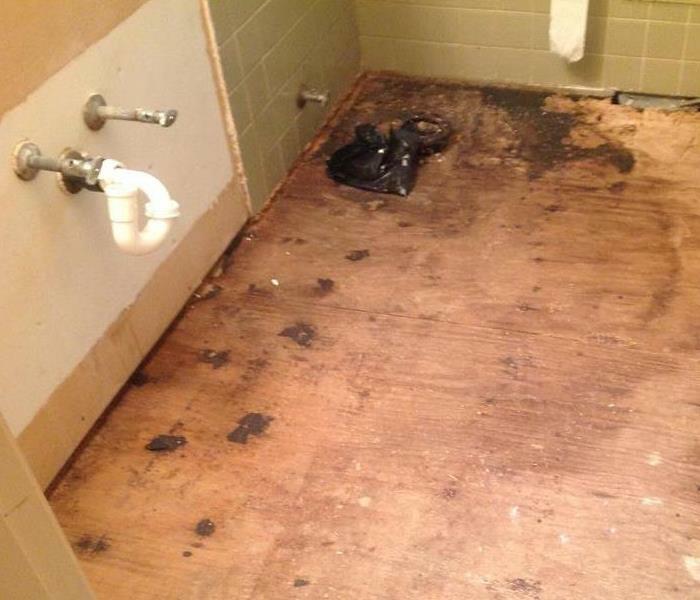 This bathroom began to leak which caused water damage to the flooring. We had to remove the flooring to dry the underneath layer. 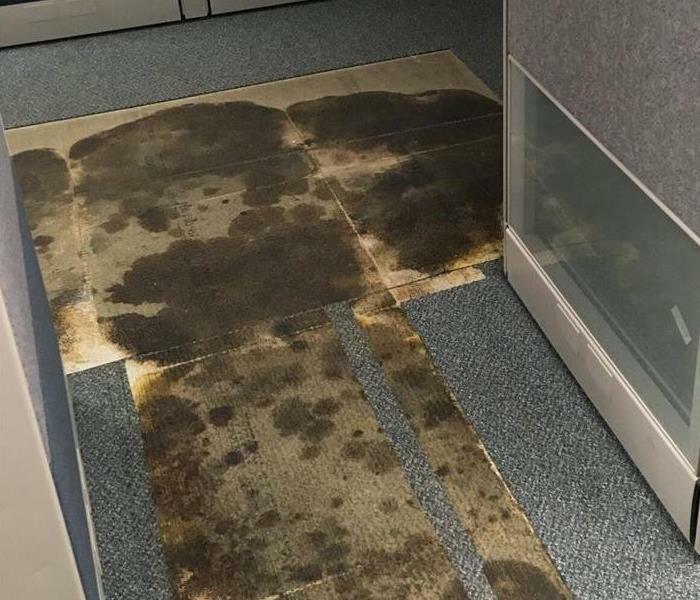 The floor dried within the proper drying cycle. 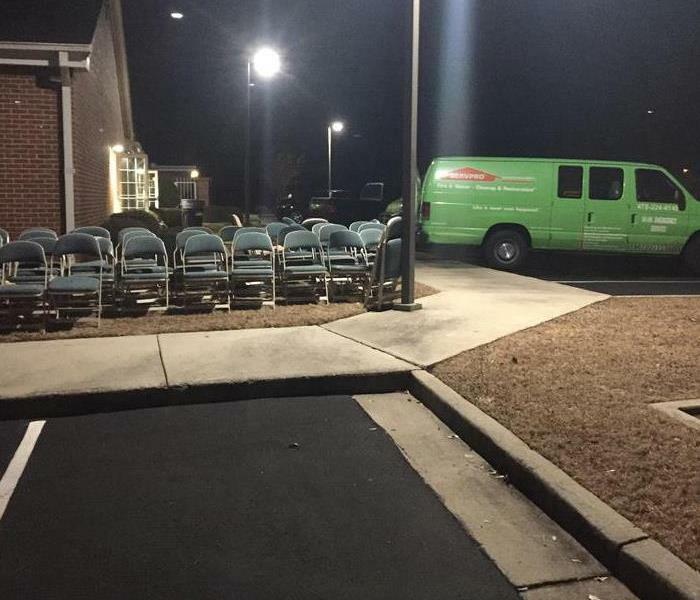 Our SERVPRO vehicles assist us and gives us the tools needed to complete our job in a timely manner. Here is a picture of one of our vehicles! We are available 24/7! SERVPRO of Houston County responded to a pipe that burst in this store. We were able to extract the water and clean any contents that were affected by the water. 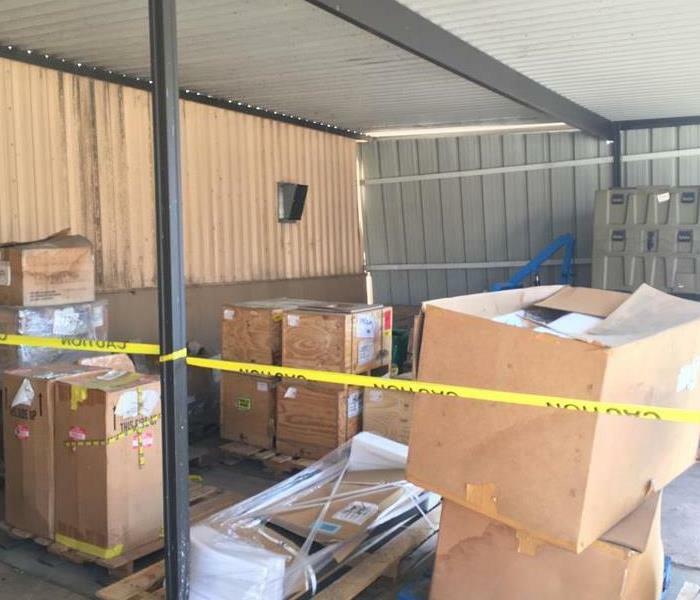 This commercial property had a few items stored outside which got saturate with water from a rain storm. 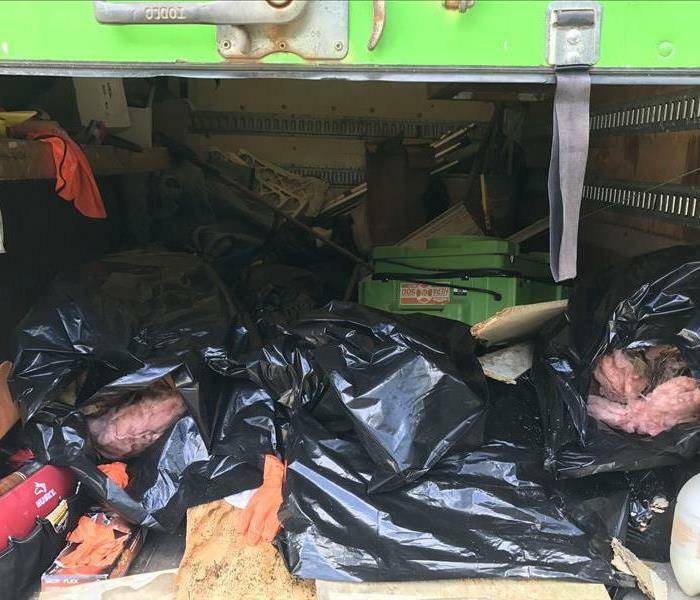 SERVPRO of Houston County went to the property to clean the items that were damaged. SERVPRO of Houston County was called to clean the contents from a home fire in Perry. 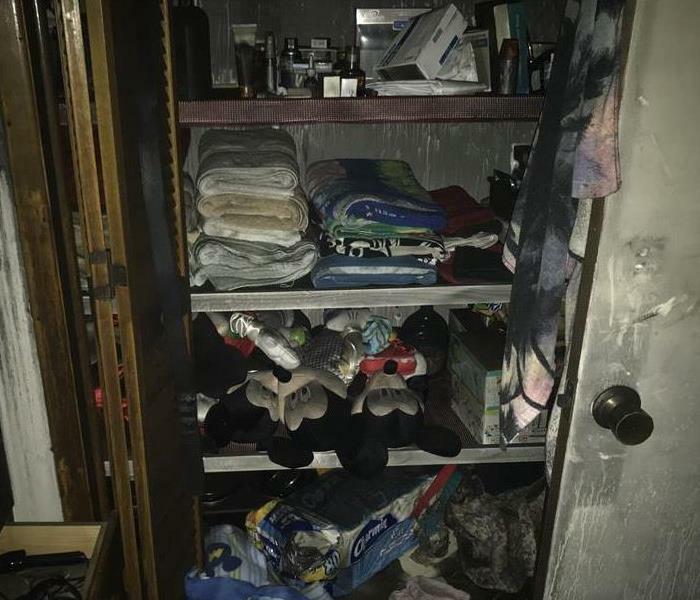 The fire started from the laundry room which is located next to the closet in the picture. A fire ignited from the fireplace in the living room across the home. 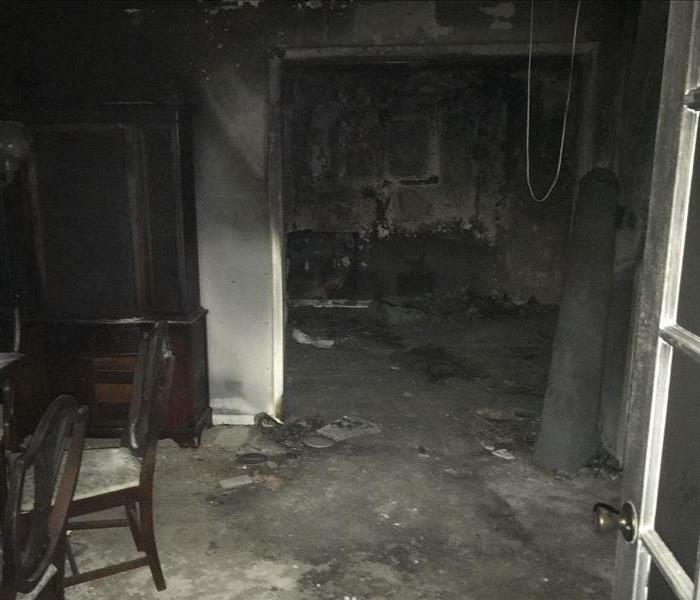 Because the fire took over the living room, smoke and soot was found throughout the home. This was the bathroom on the other side of the home. 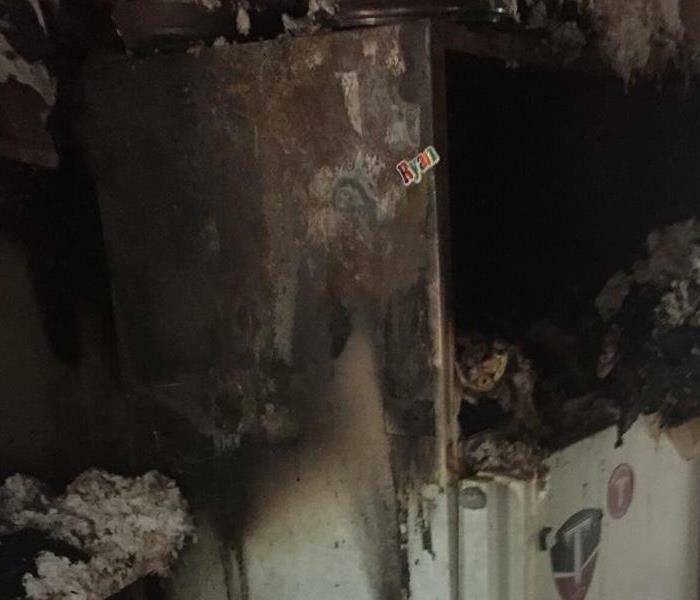 An electrical fire started in this home. The homeowners quickly called 911 once they left the home. 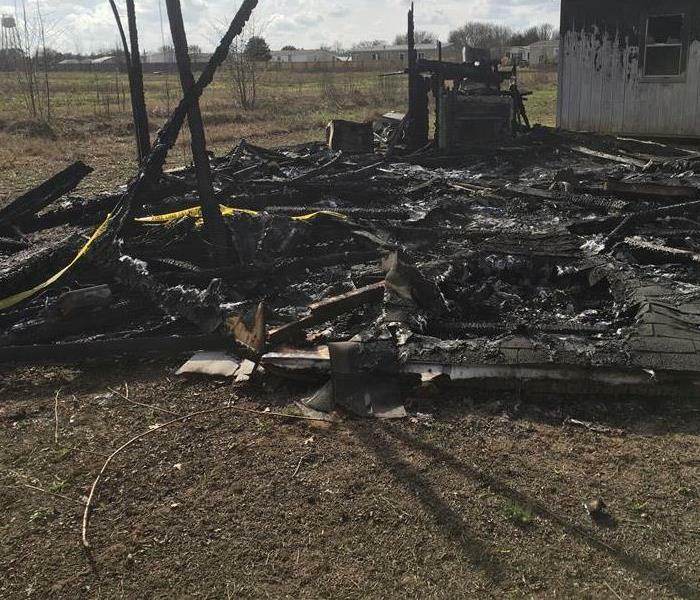 Firetrucks responded to the call immediately so some items were salvageable due to the fire being extinguished before it could take over the whole home. 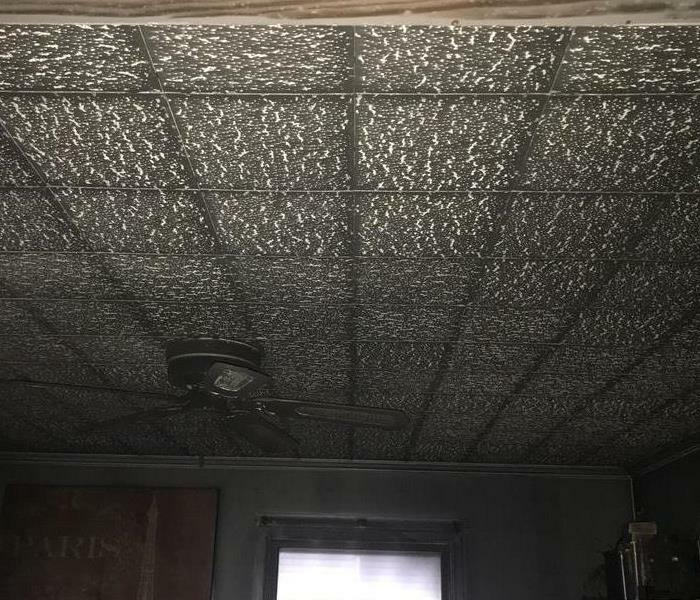 This is a picture of the ceiling after a house fire. The ceiling is covered with soot that remained after the fire was extinguished. We came in with chem sponges to clean the area. Our technician going over the steps and procedures on proper equipment and attire when entering a biohazard job. She did a wonderful job explaining each step in a way anyone could understand! Way to go! When we opened our new location, we had these delicious cookies made. They were SERVPRO styled and absolutely amazing. We had to hurry to take a photograph before they were all gone! 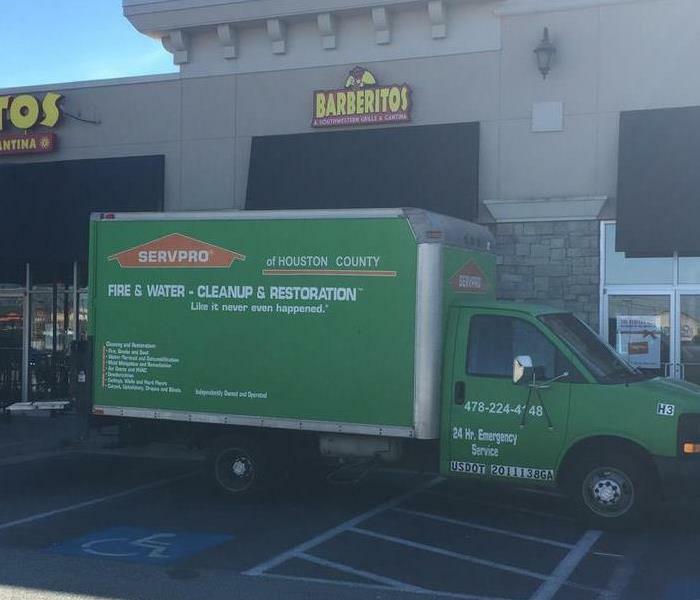 SERVPRO of Houston County responded to a call from a local restaurant. We were quick on the job to begin working so Barberitos was back to running smoothly fast! There was minimal damage. We love helping our community! 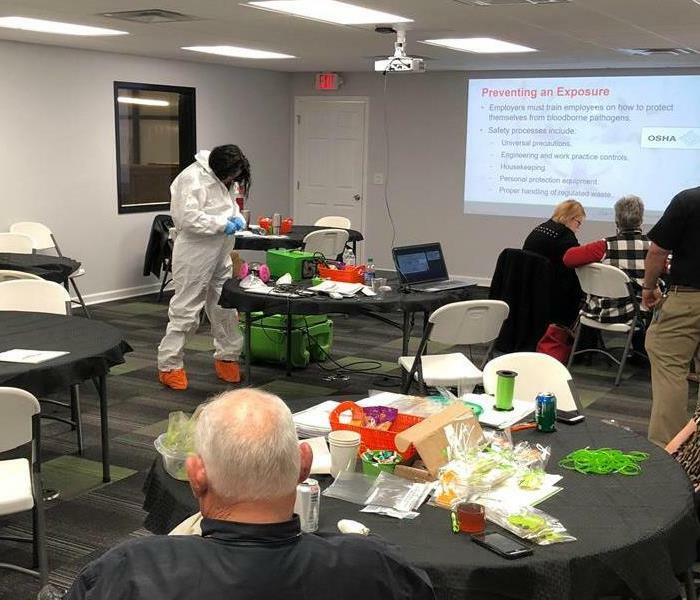 Our owner Carl and a technician teaching the biohazard class that SERVPRO of Houston County offers. We enjoy teaching this class to those who are interested in what we do on a job of this nature! 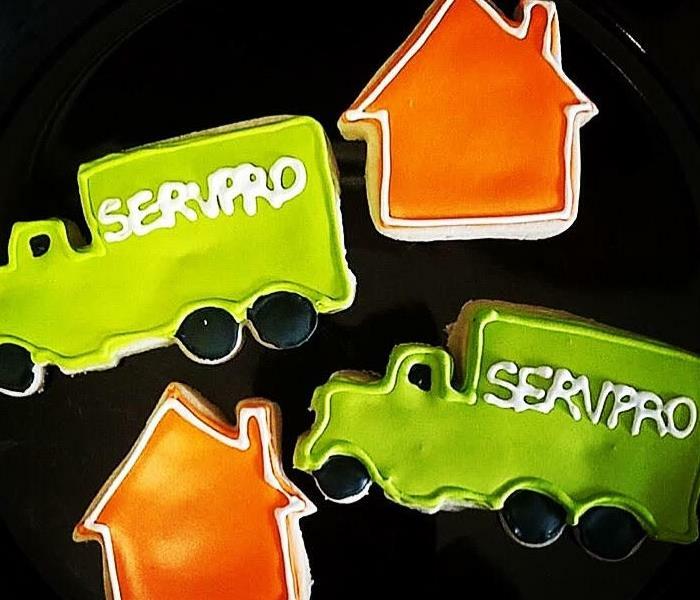 SERVPRO of Houston County was lucky enough to be able to move locations! 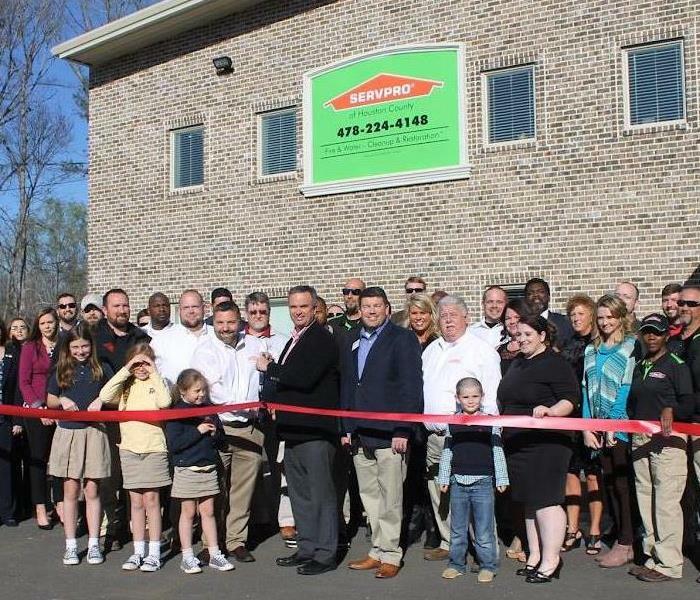 This was taken at the ribbon cutting the day we opened for business. We are in love with this new work space!